The announcement you've all been waiting for! 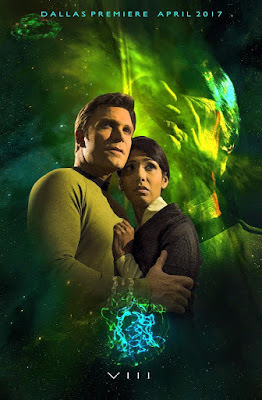 At the beginning of 2016, STAR TREK CONTINUES ran a successful fundraising campaign to produce the final episodes of our fan series. As promised, we've spent your hard-earned donations to our non-profit production company exactly as we said we would and have been working around-the-clock to finish our final four episodes as quickly as possible. Episodes 9, 10, and 11 are still in post-production and will be released throughout the year as they are completed. Episode 8 -- "Still Treads the Shadow" -- guest-stars Rekha Sharma ("Battlestar Galactica") and will premiere at Fan Expo Dallas on Saturday, April 1. We have even more amazing guest stars in these last episodes, culminating in a thrilling series finale by acclaimed science fiction author Robert J. Sawyer. We want to thank each of you for your patience while we've been busy, and also for your support and encouragement throughout our run. It is our sincere pleasure to be bringing a conclusion to our beloved original series of STAR TREK at long last. Wow! Peace and Long Life! Glad to know everything has been resolved! So glad to hear this! I was crushed thinking that this great work would be brought to an end prematurely. But how are you guys able to do it under the current guidelines environment? They are only putting to its intended use the money they raised before the guidelines were established. It's in the discretion of CBS whether to object, but STC is only making good on its promise to donors. Awesome. Glad to see we may still see a few more episodes of STC, the most promising Trek fan series since the early days of New Voyages. Can someone explain why STC seems to be reaching a concusion, I thought they would go on for years creating fan based take on the original series. As long as fans like me keep contributing to the cause, why would this cause a problem for CBS or whoever now owns the rights to Star Trek. Fans will watch anything produced by STC and CBS so what's the issue? So very excited that this great fan produced and loved series will continue for 4 more classic adventures. When I discovered this TOS recreation I was emotionally affected. To be able to relive years of my childhood in 40 to 50 minute segments was amazing. God bless you STC. I've enjoyed the series, and look forward to the remaining episodes, though it will be bitter sweet knowing it's coming to an end. Best of luck to everyone involved for the future. Live long, and prosper. You guys have done an amazing job! Hate to see it end.